Info "‘Hey! It’s me! WARIO! I know you’re in there! I can hear your breathing!’"
It'sa Me, Wario! is one of Tiny Wario's Microgames in WarioWare: Smooth Moves. Its name is a pun on Mario's famous phrase, "It's-a me, Mario!". The player must knock on the door as Wario to open it. 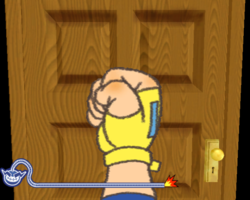 1st level difficulty: Two knocks to open, and it's a standard wooden door. A doctor, a waiter or a tired baseball player will appear. 2nd level difficulty: Three knocks to open, and it's a candy door. A girl, a boy with insomnia or a training man will appear. 3rd level difficulty: Four knocks to open, and it's a unisex bathroom door. Two men fighting, The Thinker sculpture on the toilet or a sleepy boy will appear. This page was last edited on February 20, 2018, at 17:44.